The Kilotech Integrator C price computing scale is perfect fit for the retail store that needs an inexpensive solution to weigh products for retail sale. 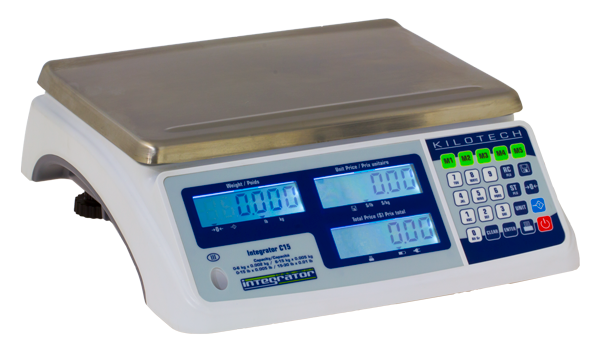 The Kilotech Integrator C scale is great for bulk food stores, candy stores, frozen yogurt and ice-cream shops, small grocery stores, coffee beans, farmers markets, convenience stores, and a variety of other retail businesses where accurate and legal for trade measurement is required. The large removable stainless steel platter makes clean-up a snap. With built-in rechargeable battery you can take it wherever you need to go, with or without external power. The large LCD panels for both the front operator and rear customer displays have three brightness levels so that the Kilotech Integrator C price computing scale can be used in a variety of light conditions, or turned down to conserve battery power. The Kilotech Integrator C is packed with features, including on-board memory that can handle up to 265 PLUs (Price Look Ups), with 5 directly accessible from the keyboard while 260 are indirectly available by number. The scale PLU feature supports commodity description, shelf-life, ingredients, tare weight, and unit price. Connect the scale to a PC with the built-in USB port and use Kilotech’s software application to program the PLUs directly to the scale. The Integrator C price computing scale is compatible with the external Argox thermal label printer. Connect the Argox label printer your scale to produce barcode labels in a variety of die cut label sizes and formats. Not sure if you want to weigh in kilograms or pounds? No problem! The Kilotech Integrator C price computing scale allows you the option of switching back and forth between kg or lb for maximum flexibility when weighing. Add this to popular functions like Save, Prepack, and Print functions, and the Kilotech Integrator C is a powerful retail scale at an affordable price.